I gave a brief presentation on “New Interaction Rituals” (PDF available here) describing the curious prehistory of interactions between humans and keyboards that then evolved into the canonical desktop interactive computer setup of keyboard, mouse and visual display. Then the questions is — "what next?" Or, even better, "what else?" A small number of current projects are described briefly to outline interactions that expand beyond the current finger twittering, button twitching sort. 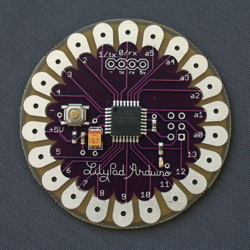 Leah Buechley’s “wearable” edition of the Arduino is this Lilypad styled PCB. 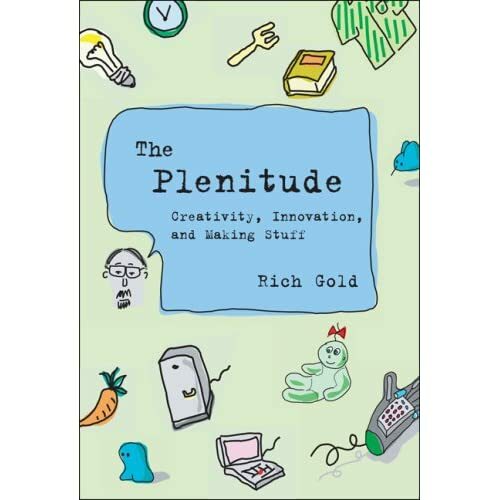 Travel Reading — "The Plenitude"
I came across Rich Gold‘s name when I decided to take proper stock of this ubiquitous computing thing maybe three or four years ago. Rich Gold, who I never knew personally, relished in being multi-discplinary, it appears. He describes the multiple hats he wore — engineer, (“pseudo”) scientist, artist, designer. It’s this sort of boarder crossing that I found most intriguing about his approach to work. He describes these hats as distinct, but ultimately I think the collapse in a way that offers unique perspectives on his creative endeavors. A colleague mentioned his work a few years ago, and then I was surprised to find little available, until I read his bio and found out he died relatively young. I quickly found a PDF of "The Plenitude" and was glad to find a proper book edition of the same work from the new Simplicity series by John Maeda and MIT Press. I’m looking forward to reading this on an upcoming trip to Amsterdam where I’ve organized a discussion session on Pervasive Media featuring Nicolas Nova, Dennis Crowley, Fabien Girardin. I finished the book on the flight back from Amsterdam and was a little disappointed. The beginning was a great set up for what I thought would be remarks on innovation, creativity and design — perhaps a bit on design theory as it relates to the tension between traditional creativity and culture-makers and the demands of consumer capitalism to create new “stuff” (the “plenitude” of things that we accumulate.) I found less there to feed my brain in this regard. It left me wanting a bit more — and then I realized that about half of the material that was in the PDF has been edited out it seems. The whole section in the PDF on Evocative Knowledge Objects (“EKOs”) is gone — I can’t find it in the book. That material, in my mind, are the more provocative insights to be offered. 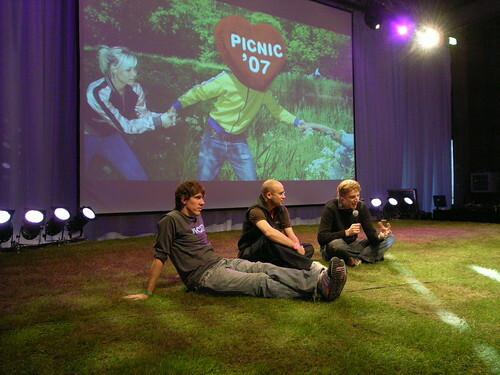 The descriptions of “the plenitude” as a suckers mediation of experiences is a little embarrassing at worst, and dated at best. In light of more nuanced theories of production, consumption and the circulation of culture, Gold’s remarks on us and our relationship to our stuff is a bit conservative and, well..kind of wrong. Suggesting that there is a simple relationships between us, the people who sell us stuff, and the way they mediate between our experiences as if it were a simple two-way relationship just doesn’t hold water. For example, playing baseball in the backyard versus being sold tickets to watch it at a park, or paying to subscribe to television to watch it at home, or paying for video game cartridges to play a video game of playing baseball doesn’t capture the nuance of the situation between fans, heroes, and the cultural-industrial complex that brokers the relationships amongst them. It’s curious to me that the book doesn’t contain the interesting auto-biographical material that describes Gold’s experiences and that lead to various insights on the relationship between design, technology and everyday life. Particularly his material on EKOs as kinds of “theory objects” would have been nice to disseminate in print. Posted on September 21, 2007 August 18, 2017 Author JulianCategories Design Art Technology, GeneralTags Theory Object2 Comments on Travel Reading — "The Plenitude"
Some scenes of the particular strategies for maintaining a sense of comfort, ownership of space and a spirit of home-is-where-the-shoes-can-be-removed. What are the ways that comfort can be maintained even when in uncomfortable, cramped, public, awkward spaces? 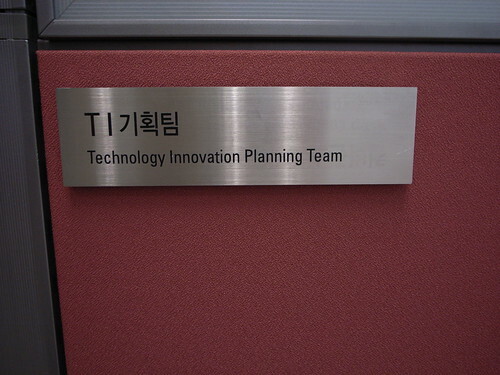 Nicolas and I gave a talk serendipitously organized at SK Telecom’s Technology Innovation and Planning group. The purpose was introductory. I had met the group’s leader, Jong Chae Oh at a workshop organized by the Institute for the Future’s Mike Liebhold. It was an opportunity for sharing process, methodology and some aspects of the Near Future Laboratory’s areas of interest and activity. We spent 2 hours talking, exchanging about foresight methods, trend analysis and how it’s difficult to have a rigorous scientific methodology. Our point was that we aimed at mixing wide-analysis of social, cognitive and cultural trends to inspire sketching and prototyping + testing. 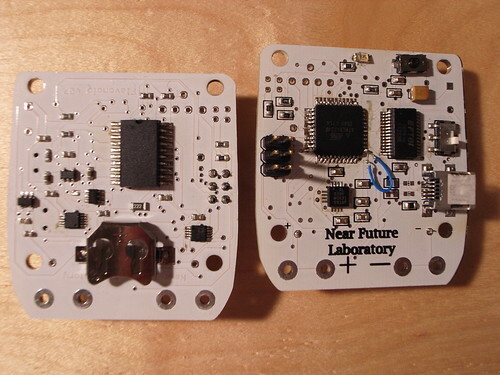 Prototypes are not the end per se but a way to try and gain some understanding about tech uses and innovation. A sort of bricolage way to inspect the near future. We insisted on this aspect that we did focus not on tomorrow’s design nor long term-range foresight but 3-4 years ahead. The presentation also included past project description such as the blogject workshop serie (See the report here and there), insisting on some concrete outcomes and how we appreciated that the meme spread and lead some attendants to design their own projects (see Blinks and Buttons for example). Present projects we described revolved around the “new interaction rituals” (going beyond current I/O in pervasive computing) and the “new interaction partners” (letting pets participating in video games and the social web). 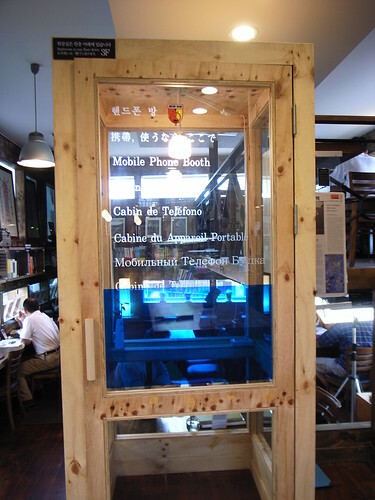 Found in Insa-dong district of Seoul, in a combination bookshop / cafe / newsstand. Bruce Sterling commented the other day that Seoul was one of the quietest cities he has experienced. I had not “heard” the city that way, but after talking about this point I realized that it was indeed quiet. Not forest and trees quiet but the usual ambient din of the cities I have experienced is not here — no sirens, no jack hammers, no overly loud yammering cell phone conversations. People talk very quietly on their cell phones, often covering their mouths. I have yet to hear a fire or police siren, although a police car passed us pedestrians on a small crooked side street the other evening, it only had lights flashing and no other emergency noises. While there is a full-on dig going on to construct an subway line around the corner from my hotel, I have never heard any noise from there — there is a noise baffling wall — clear glass, not the usual closed off barricade despite the fact that there must be a lot of rough and tumble rock moving underground. I am most thankfully amazed by the lack of loud yammering cell phone talkers. What can be done to mitigate the yellers? More audio feedback of their own voice into the cell phone speaker so that they can self-modulate?